This card has earned iconic status in the hobby on its way to being one of the most valuable basketball cards ever produced. Numbered to 99 copies, this card is the key to one of the most impactful basketball card sets ever produced. Packs of these used to cost $500 apiece when the set was first released. Dwayne Wade, Chris Bosh and Carmelo Anthony are some of the other big names in the set but Lebron James is by far and away the most desired. It's incredible to think that a modern card could cost so much but that's what happens when you combine a player of James' stature with such an iconic set. In 2016, this card sold for $312,000 at auction and I would imagine it will eventually sell for more if it ever comes up for sale again. The card is literally one of a kind as it was the only version of this card ever produced, as noted by the "1/1" in ink below the NBA logo. 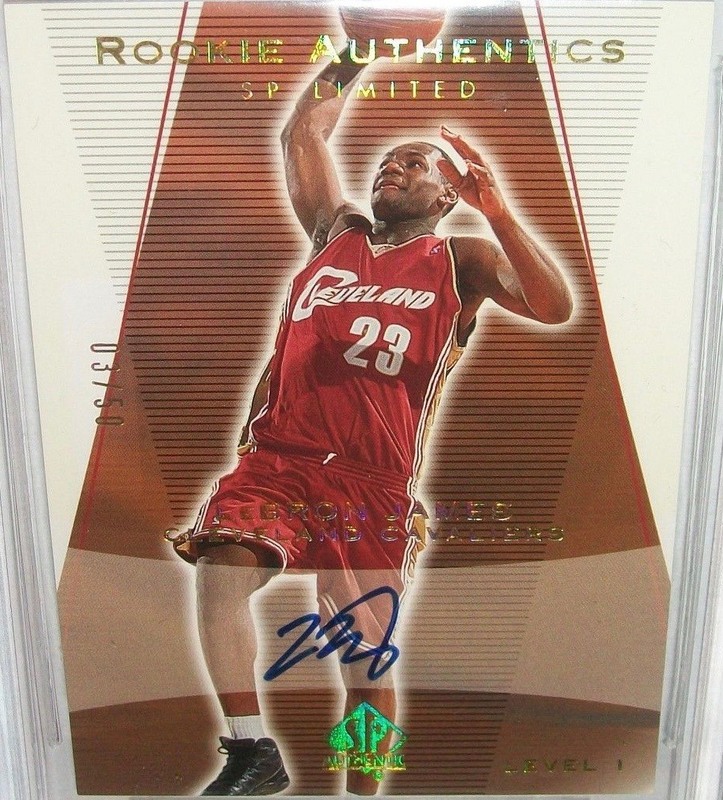 The card features a great action shot of a young Lebron, a nice autograph and huge logo patch. PSA did grade this card and deemed it to be in PSA 9 mint condition. I've always loved the straightforward design of this card--the imagery is clean, the autographs are sharp. It's just a solid-looking card overall. But they are by no means even close to cheap. Perfect examples of these cards will set you back well into the five-figure range. Numbered to 250, they are also very limited. Topps Chrome has always been one of the most popular series of basketball cards and this is arguably the most desired of them all. Numbered to just 50 copies, these gold refractor parallels continue to be in high demand. A great action shot of James fading away during a jump shot, gold borders, and the "Draft Pick #1" at the bottom give this card strong eye appeal. 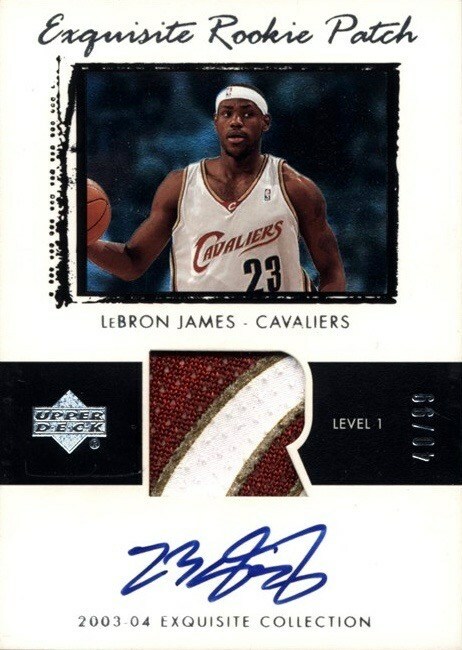 Another key Lebron James card to own from the 2003 Exquisite Collection series, this non-autograph card has remarkable value to it. Although it is rarer than the aforementioned autograph/patch card, the lack of those two key features drops its value down much lower. But, let's be real, the price on these cards is still incredibly high. 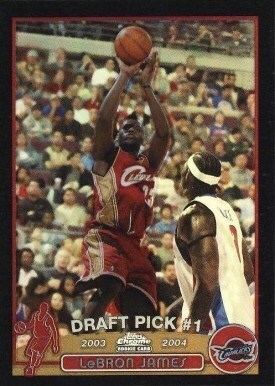 The design of this Lebron James rookie card almost seems like it has too much going on at the same time. They are numbered to only 25 examples so they're quite rare. And the autograph and jersey patch no doubt create strong eye appeal by themselves. But, I really have to be honest and say that I don't like the design of this card nearly as much as do some of his others. At a five figure price tag, though, I could forget about the design really quickly! Now, this is a great-looking card but finding a good picture is tough. Only 50 copies of this card exist so finding them can be quite a challenge. And if you do see them come up for auction, they're yet another James card that will set you back five figures. Finest was one of the most popular series during its day. 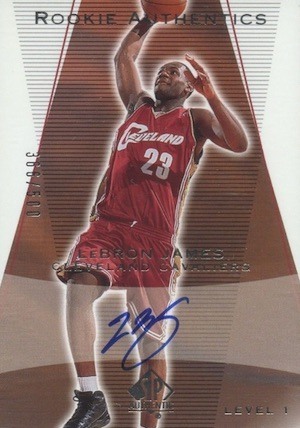 And this gold refractor numbered to 25 is one of Lebron James' most expensive cards ever made. Their scarcity made it another tough card to find a decent picture of but here it is. The design is definitely unique and screams Finest all over it. There's also a 1/1 X-Fractor version of this card that would be anyone's guess as to how much it would sell for. Much more than this one that's for sure. The X-Fractor versions of this card were numbered to 220 so they're not quite as rare as the gold version. I do think their design makes them look pretty cool, though. Still incredibly expensive, these cards are estimated to sell around $20,000 in PSA 10 condition. The bronze-colored background on this card gives a nice contrast and really helps the image of James going up for a dunk to really pop. Numbered to 500 copies, these cards are another example of a James rookie with a solid look and feel to it. These come up for sale quite a bit but they'll still sell for huge money. What a great-looking card. James may not be depicted in action but that youthful smile and appearance along with the gold refractor styling give this card strong eye appeal. Interestingly, the Dwayne Wade and Chris Bosh rookies featured in this set do possess their autographs while James' card does not. You'd think the autographs would put their cards in range with James'...but it's not even close. His base card is still worth more than those and this gold refractor version (numbered to 50) blows them all out of the water. Only 50 copies of this great-looking card exist so tracking them down can be difficult. The image of a young Lebron James is great, the gold design layout of the card makes it pop, and the autograph is nicely placed. It's just yet another solid card overall. The black refractor versions of this card were numbered to 500 copies making them the third rarest version of the refractors. Interestingly, there were more than double the amount of these produced than the X-Fractors yet the price difference between them is not nearly as drastic. 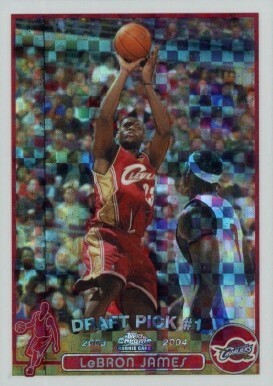 Of the Lebron James rookie cards with horizontal layouts, this one might be my favorite in terms of design. I enjoy the imagery, color scheme and placement of the autograph. I just like the way it all fits together. Numbered to 100, these cards are yet another of his that can command five figures in top condition. This is one of the most unique designs on this list of James rookies. The card is not square and features drastically-rounded corners instead. It's an odd-looking card overall with a lot of things going on with it but they remain quite valuable. This is the only card on this list that's estimated to not set you back five figures or more. Lebron James is easily one of the greatest players to ever set foot on the court. But his legacy remains to be completely written as he's still playing. And he's still playing at an incredibly dominant level after many seasons of doing so. He plays with intensity and a determination that you just don't see too often. His status as one of the NBA's greatest players of all-time is already without question. But, we'll see just how far he can go. His dominance and extreme popularity will keep his rookie cards in high demand for a long long time.